I've been telling you about Slotland’s 17th birthday celebrations all through this month. They've had Freebies and Match Bonuses and the site-wide progressive jackpot was even hit just as the party began! Now we get the best birthday present of all -- a new game! Open Season is new a hunting-themed game with free spins with a stacked wild, a symbol replacement feature and mystery cash bonuses. All players can enter bonus code 20FREEBIE to receive this no deposit bonus. Bonus code TRYME100 gives a 100% bonus with 13X wagering requirement. Bonus code TRYME80 gives an 80% bonus with 10X wagering requirement. Bonus code TRYME40 gives a 40% bonus with only 6X wagering requirement. The Freebie and the 100% bonus can only be claimed once, but the 80% bonus can be claimed once a day and the 40% bonus is available up to four times per day. Open Season’s stacked Wild symbol is a pack of hounds that's sticky during free spins. It’s not the only symbol that will increase your wins though! Three or more “Mystery” scatters pay out an immediate cash bonus, three or more “Bonus” scatters trigger free spins, and a “Double Wild” doubles winnings on a payline. The symbol replacement feature boosts chances of winning. Occasionally, a hunter appears on the screen and shoots at non-winning symbols on the reels, replacing one of them with Double Wild symbol. The bonus game really gives players a chance to increase their winnings. First, a hunter shoots at a target to determine how many free spins will be given. Then, depending on how many Bonus symbols have initiated free spins, sticky Stacked Wilds will cover up to three reels generating multiple winning combinations. 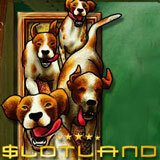 Open Season is a premium slot game tied to Slotland’s site-wide progressive jackpot. The Bear symbol pays up to 500X and five bears with a Max Bet placed wins the global jackpot. Earlier this month Charles M. got the birthday party started by hitting a $207,619 jackpot playing the Grand Fortune slot. Slotland's birthday celebrations continue through October. A draw at the end of the month will award $6500 in birthday bonuses. All players that deposit at least $75 between October 16 and 31 will be included in the prize draw.